From The Guardian in the UK. Pictured is Fireman Sam character, Hannah Sparkes. Fireman Sam and How to Train Your Dragon feature the only disabled characters currently on long-running children’s television franchises. Other characters crop up here and there – the Disney Channel introduced double-amputee Aussie explorer, Wildlife Will to its Doc McStuffins show, and it featured wheelchair user Johnny McBride (voiced by Shia LaBeouf) in The Proud Family – but both appeared for one episode only. 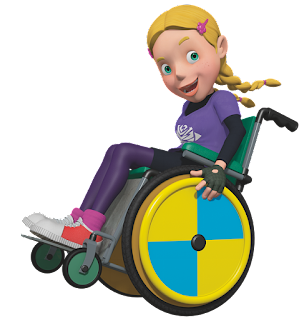 The BBC has a history of disabled characters, from Grange Hill’s Rachel Burns with cerebral palsy (played by comedian Francesca Martinez), to Balamory’s wheelchair user Penny Pocket. The broadcaster also has its visual impairment show Melody, and sign-language show, Magic Hands. The public service broadcaster’s remit to “reflect a wide mix of children and presenters in terms of disability, gender and ethnicity”, means inclusivity is expected. What shouldn’t be expected, is the commercial sector’s relative lack of interest. Among the major commercial producers we contacted, the Disney Channel, Zodiak Kids and Nickelodeon do not have a single current children’s show with a prominent disabled character. FremantleMedia however, (responsible for the likes of The X Factor), does have its comedy series Strange Hill High which is aired on CBBC and includes Samia Speed (witty and in a wheelchair), school caretaker Murdock (with a bionic hand) and hero Mitchell Tanner (living with ADHD). But given that one in 20 children in the UK have a disability, this is pretty scant representation. The need for better representation, says Philip Connolly, policy and communications manager at Disability Rights UK, comes from “seeing people like ourselves on-screen. She adds that better representation is also important for exposing non-disabled children to diversity to encourage them to be non-judgmental and encourage interaction. This could mean that producers are missing out on a commercial opportunity. The BBC’s Mr Tumble helps children with special needs through his use ofMakaton (a language programme for individuals who can’t communicate efficiently by speaking). Created by former BBC producer Allan Johnston,Something Special starring Mr Tumble (played by Justin Fletcher) has been Britain’s most popular children’s performer for over a decade, appealing to children of all abilities. While FreemantleMedia’s popular Tree Fu Tom series was originally developed by producer Dan Bays to help children with dyspraxia. 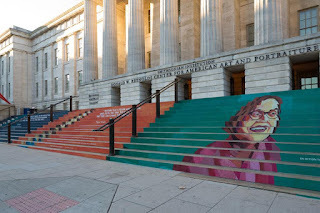 Take a walk around D.C. this weekend, and you may stumble across some newly installed murals honoring leaders in the fight for equality for people with disabilities. This Sunday marks the 25th anniversary of the passage of the Americans with Disability Act — landmark legislation signed into law in 1990 that prohibits discrimination on the basis of someone’s disability. Google.org — the philanthropic arm of Google — is celebrating the anniversary and the start of the Special Olympics this weekend with these installations throughout the city. There are 10 temporary pieces at six locations in the city. The murals are stickers, illustrated by Darren Booth, and will be removed Sunday. Each mural honors a different person with his or her portrait and a quote. Among those honored are Tia Nelis, the president of Self Advocates Become Empowered; Tom Harkin, the former lawmaker who introduced the ADA in the Senate; Kathy Martinez, the former assistant secretary of labor; and former President George H. W. Bush, who signed the ADA into law. The murals can be found at the National Portrait Gallery, National Museum of American History, Woodrow Wilson Plaza, Newseum, Gallaudet University and the Carnegie Library. Google will also have these sticker murals displayed in Los Angeles, where the Special Olympics is being held this year. “There is a feeling of nervous excitement that I haven’t felt in quite a long time,” Ms. Matlin said in an email. Ms. Matlin, who is deaf, grew up performing in plays and musicals in sign language at the Center on Deafness in Chicago. She will make her Broadway debut in a cast of 27. Michael Arden is directing the production of Duncan Sheik and Steven Sater’s 2006 musical, which will open at the Brooks Atkinson Theater in September. Ms. Matlin will play Frau Gabor — mother to the young protagonist, Melchior — as well as Frau Schmidt. In this production, Melchior’s best friend, Moritz, is also deaf, and Frau Gabor “serves as a role model and source of compassion and inspiration” to him, according to Ms. Matlin. “Because of its themes of experimentation, self discovery and miscommunication between adults and teenagers, ‘Spring Awakening’ lends itself toward being restaged in song and sign,” Ms. Matlin wrote. When asked if she was now gunning for EGOT status (that is, to win an Emmy, Grammy, Oscar and Tony), given her Oscar and several Emmy nominations, Ms. Matlin joked that she was working on voice lessons for an upcoming album. “The first Deaf EGOT. Wouldn’t that be something?” she wrote. On July 20, 2015, President Obama delivers remarks in the East Room of the White House celebrating the 25th Anniversary of the Americans with Disabilities Act. July 20, 2015. About 13 percent of all public school students receive special educational services and state spending for these students is rising.1 In Michigan, for example, spending rose 60 percent from 2000 to 2010.2 While service costs have been increasing, the share of the costs covered by federal funding has been decreasing. CHICAGO (AP) -- Disabled prep student athletes will be given full opportunities to compete in certain sports under a settlement with the Illinois High School Association that Illinois Attorney General Lisa Madigan announced Wednesday. Lake Forest High School swimmer Ana Kohout had a meet for the ages last November, when she won two events and finished second in two more at the state championships. Such results usually would yield a huge number of points for her team, but in her case, Lake Forest got nothing. (CNN)It's not always a label you're born with. Sometimes, being disabled is something that happens to you over time, after years of living a healthy life. As a kindergartner in a large public school, my son, who has a language-based learning disability, was mainstreamed in a general education classroom and shadowed throughout the day by an aide, or paraprofessional. Alternative communication methods and an assistant to help people with a disability communicate during court cases are just two reforms included in a bill that has passed South Australia's Lower House. On July 26, 1990, President George H.W. Bush signed into law the Americans with Disabilities Act, which prohibits discrimination against people with disabilities in employment, as well as transportation, public accommodations, commercial facilities, telecommunications and state and local government services. They probably don't intend to be rude or mean, so I've learned to give them grace, and to teach them. Any seasoned disability-rights advocate will understand that it is a joke when I quip that one place we are always first served is at the doctor’s office. CHICAGO (WLS) -- More educators are recognizing the importance of early-childhood education, beginning with preschool. PORTER TOWNSHIP | Elaine Reeves Haywood came from Chicago to Boone Grove High School with one goal in mind: to teach her son, Malcolm, to ride a bike. Because they enjoy dancing so much, Jefferson Bryant and Darwin Leaks, consumers of Tradewinds Services, rarely sat down during the recent Social Dance for people with special needs. Dozens of others joined them on the dance floor at the Jean Shepherd Center in Hammond during the event sponsored by Friends and Family of Northwest Indiana. 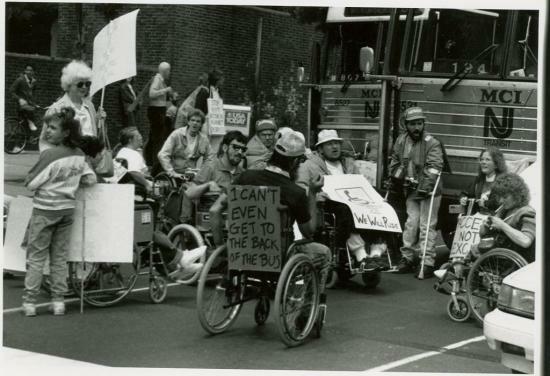 The Americans with Disabilities Act will be 25 years old on July 26 and those who have labored to develop it and raise consciousness of it continue to fret over continuing barriers to transportation; employment and communication. EAST PEORIA — When Illinois Central College decided to start an adult version of the Penguin Project, founder Dr. Andy Morgan was overjoyed. For the 25th anniversary of the Americans with Disabilities Act, the City of Worcester will be holding a celebration on Saturday. It will go from 12:00 PM to 4:00 PM at Union Station, 2 Washington Square in Worcester. Enacted in 1990, the ADA is a civil rights law that prohibits discrimination against individuals with disabilities in all areas of public life, including jobs, schools, transportation, and all public and private places that are open to the general public. The purpose of the law is to make sure that people with disabilities have the same rights and opportunities as everyone else. July is a month when we celebrate our freedom as a country and as individuals, and recommit to protecting liberty for ourselves and our loved ones. Not only is it the month in which the Declaration of Independence was signed, but it is also the month in which the Americans with Disabilities Act was signed in 1990. Is your website fully accessible to the disabled? It has been 25 years this July since President George H. W. Bush signed the Americans with Disabilities Act into law. As we come together to celebrate the achievements of the L.G.B.T. community this month, get ready to witness the pride of the disability community. June 26 — The Equal Employment Opportunity Commission under the Americans with Disabilities Act should permit employers to offer the same financial incentives for participation in workplace wellness programs that are currently available under the Affordable Care Act and its implementing regulations, congressional Republicans and multiple business groups said in comments submitted to the commission. Following a thuggish pack of deaf high school students through prostitution and stomach-churning violence, Ukrainian director Miroslav Slaboshpytskiy’s “The Tribe” isn’t for the weak-hearted. The film, told entirely in sign language, has won top prizes at almost every international film festival abroad. It screens this week at St. Anthony Main. Vivacious Russian star Yana Novikova, who like the other cast members is deaf, appeared last month at a preview screening of the film, sitting down later to discuss her debut with the assistance of two sign language translators. Q: How did you begin your acting career? A: I always wanted to be in a deaf acting program. I fell in love with it at 6 or 7 when I watched “Titanic.” That was what inspired me. My mother told me “That’s probably not possible because you’re deaf.” The problem I had was that I live in Belarus, where there’s not a lot of opportunities for that program in college. They really have only two options for deaf people. Mechanical engineering was one option or I could be a seamstress. I didn’t like either one. They had a theater school program in Kiev, an academy that had very difficult requirements. It was an entirely hearing program with spots for just three deaf participants. The academy didn’t take me and I was heartbroken. It was my dream to be an actor. But Miroslav Slaboshpytskiy was in the audience, watching our auditions. He gave me his business card and asked me to come back and audition for “The Tribe.” I was really surprised and very excited, so I came back to Kiev. And now there were 300 deaf people auditioning for that movie! A week later I found out I was cast. Q: “Titanic” is romantic. “The Tribe” is so dark. How did you feel about performing in such a demanding film? A: As an actor, the part is the goal. Whatever emotion a character has, happy or sad, that’s my goal. “The Tribe” is very dark, yes, really awful sometimes. But it was my first acting opportunity, so I was thrilled to take advantage of it. Q: Your character experiences so much pain. Was that an emotionally trying role? A: It was very different from my life, constantly needing money, the physical abuse, being a prostitute. So for me to try to think about what Anya was experiencing, that was very difficult to get in that person’s head. Q: It portrays the school experience for deaf students as one full of violent hooligans. Is that entirely fictional or is there some truth? A: I wouldn’t say it’s 100 percent accurate, but the director did use real stories from real life situations and kind of collaborated them into one. He did want to show that the deaf have a mafia, if you will. They really do have that in Russia. And when it showed to deaf audiences in Ukraine, a lot of them cried and said, “That really happened to me.” It really resonated with them because they really connected with a lot of those characters. Whenever Nike releases a new pair of sneakers, it's kind of a big deal. Most of the time, this is because of the way the sneakers look. However, the athletic apparel company is releasing a new pair of sneakers that is grabbing headlines not because of how it looks but how it can impact the wearer's life. Nike's new Zoom Soldier 8 shoe will come with Flyease technology, which helps people with disabilities, such as amputees, stroke victims and people with cerebral palsy, put on and take off their shoes with one hand. A zipper wraps around the shoe and opens up near the heel, allowing the wearer to easily slip his or her foot in and out of the sneaker without any need to tie or untie laces, which can obviously be a challenge for those who don't have full use of both of their hands. Nike Senior Director of Athlete Innovation Tobie Hatfield started to design the shoe seven years ago after CEO Mark Parker requested he help the company's first employee Jeff Johnson when he suffered a stroke and could no longer articulate his right hand, according to Co.DESIGN. However, it wasn't until around the time of the 2012 Summer Olympics that the idea for Flyease really took off after Parker again asked Hatfield to help design footwear for a then-16-year-old Matthew Walzer, who lives with cerebral palsy. Here's how Flyease works, according to Co.DESIGN: "The zipper isn't any old zipper. It's been built to work around a curve, a challenge that required Hatfield to tap the expertise of Nike's apparel team. The zipper itself connects to a velcro strap that seals the top of the shoe. But you don't need to yank hard on this strap to zip and unzip it. Rather, once the velcro has been undone, you can grab the top of the heel and unpeel it like an orange...Meanwhile, the shoe's upper tightens and loosens in tandem with the zipper system. How? A tunneling system filled with internal cords wraps from the heel all the way around the shoe's upper to sit on top of the instep, where they resemble laces." 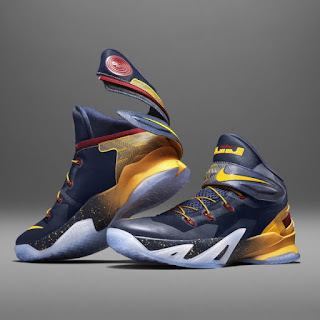 Though it took several iterations and testing on 30 different basketball players on Nike's own courts to get this shoe just right, the company says it plans to continue to test and make improvements to Flyease in the future. The shoe will be available in limited quantities on Nike.com starting July 16. This sign was created to indicate handicap accessible places, such as bathrooms. Wikimedia Commons. Surface changes underfoot, as a way to signal the need for caution, are now required in many environments. Division of Medicine & Science collections. Years ago, I witnessed the power of art to soothe the troubled mind. I was at the Elgin Mental Health Center to write a story about a local group that handed out colored pencils, charcoal and drawing paper as a way to help patients suffering from severe mental illness harness their creativity. This wasn't meant to be therapy, but a fun diversion for people dealing with some very tough issues. Still, I was struck by the pride they took in what they produced: One young man, after dismissing his ornate, graffitilike sketch as worthless, changed his mind after hearing a compliment, and carefully sandwiched the picture between two blank pieces of paper to keep it from smudging. Art isn't just a restorative tool for people with anxiety, schizophrenia and other mental disorders; it's also a way to explain to the world what's going on inside their heads. You see this everywhere from "The Scream" to "The Bell Jar" to a slew of contemporary comics that use arresting graphic imagery to illustrate their creators' experiences. Now comes an animated musical comedy called "My Depression (The Up and Down and Up of It)," created by Broadway playwright Liz Swados. The 30-minute film, which premieres Monday night at 8 p.m. on HBO, reminds me of a "Schoolhouse Rock" episode with its simple style and catchy tunes, including one upbeat number on suicide, of all things. The approach might sound weirdly lighthearted, but it manages to stir a sense of empathy while packing in a lot of information about a disease that, according to the National Institute of Mental Health, afflicts 7 percent of adults.I spoke with Swados about the unusual medium she used to chronicle her struggle with the illness, and what she is hoping to accomplish with the film. Our conversation has been lightly edited for length and clarity. 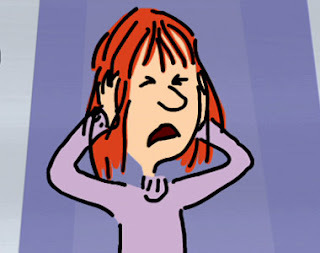 Q: Why a cartoon musical comedy about depression?A: It started out as a book. I had a friend who was very depressed and I wanted to give her something, so I made a cartoon book for her. When she got better, she thought it was good enough that it should be published. Someone suggested we make a movie, so we got some money and made a sizzle (a short version of a film used to drum up interest), and we showed it to HBO. They wanted to do it, so it was great. Q: Are you concerned some people might find this style to be inappropriate?A: The thing is that people have been doing things about mental illness, and they've been making them soft and sweet. They're not telling the truth. People who suffer from depression know that the truth is something a lot more painful. So what I tried to do is mix the truth with humor, so that the reality would be a combination of something extremely hard to take but also fun. It was a risk, but I think it worked. Q: I think artists sometimes believe there is something noble about enduring depression. Did you ever share that attitude, and what do you make of it now?A: I absolutely disagree with it. I don't think anything is made when someone is suffering. I don't think people have to feel bad to do good work, and I don't think they have to act terribly to create good things. Q: Mental illness is not something a lot of people want to talk about. Why were you comfortable discussing this in such a public way?A: It was the momentum of what happened. I wanted to give (the cartoon book) to one person, and it just had a momentum from there. I thought it might be helpful, and I thought maybe it would wake some people up. I do believe, as an artist, that there is an obligation to help, so I went along with my gut. Q: You've been dealing with this since you were a teenager. How often do you experience a depressive episode these days, and how do you handle it?A: It comes and goes. Years go by and there's nothing. Then there's another year and it (lasts for) three months. The way I handle it is through medication and therapy. Q: What's the most important thing you've learned in terms of managing the symptoms?A: That they end. The feelings go away. Trust that you can be helped and it can be taken care of. Don't give up hope. Q: What would you like people to get out of the film?A: That they're not alone. People who have these symptoms are not alone, and they can be helped. It's not something to be ashamed of. We have to get rid of the stigma. It's an illness like any other.